I’ve set a new record for myself on the road. I achieved 24.8 miles per gallon of gas in my Hyundi Sonata in a test! I’m sure this does not sound like much for you in your Prius. But for me, not bad. I’m accustomed to lower mileage. I obtained my driver’s license at 18 and I looked forward to this test last week-a feat to cap my 64 years at the wheel. I was excited when I started the final arithmetic. But I admit I was disappointed with the 24.8 result. I had been driving with such constant care throughout the test of nearly 400 miles that I expected a more dramatic score. After all, I had used every trick I knew to maximize that result. That 24.8 was for my mileage over 13 days. I re-did the arithmetic to make sure my answer was correct. It was. I had been hoping for 30 miles per gallon. I had gone online. My Sonata is a four-door 2010. For it the Hyundai website claims 24 city/35 highway miles per gallon. My driving was a combo, in fact leaning toward the highway driving. My heaviest driving was in New London on two visits, but I also made a round trip to Hartford. I have the highest regard for Hyundai, but I believe reaching that claimed 35 mpg is as realistic as breaking the sound barrier. I’d love to talk to anybody who has ever gotten more than 30! I have owned some 30 cars. I have driven hundreds of thousands of miles—more than a million, I figure. This is my best mileage ever, I believe, as modest as it is. It comes when gas prices are the highest I’ve ever coughed up. More than $4 per gallon! I paid 27 cents a gallon when I got my first car in 1950 and that hurt my pocketbook so bad that I remember it to this day. That was a snappy Terraplane coupe, by the way. Vintage ’38. Two doors; a single bench. I was a junior in college. It cost $100. My father gave me $50 and I scrounged the other $50 from my Aunt Bernadette. What a nice memory. I remember when the price dropped to a wonderful 17.9 in a gas station war. Those wars sprang up like wild fire. They were wonderful for us consumers. Hated to see them end. I haven’t seen a real gas war in years. It makes me think there may be collusion now. How does it happen that gas stations in a whole neighborhood seem to display basically the same prices every day? Anyway, I have become a careful driver and frugal. I consider it dumb not to be. I admit that during these stratospherically spiraling gas prices I’ve been even more watchful. Everybody I know is complaining about these astonishing, numbing prices. It’s right near the top as our biggest topic of the day. Truth is, I hear more about the day’s gas prices at the coffee shop than I do about Iraq and Afghanistan, which are much more serious. And know what? Despite these incredible prices, I am astounded to see so much dumb driving on the road. Driving that wastes gas and that means money. Crazy! Yes, I take pride in wrangling my dollar’s worth. It’s this habit that accounts in part for my untroubled financial life these many years. Oh, I didn’t tune up my Hyundai Sonata for this trial. Didn’t check my tire pressures, which is recommended for top performance. No special preparations of any kind. The idea to run a test hit me on the morning I paid $4.14 per gallon for a fill-up. Incredible! What American over the age of 30 ever expected to see such prices? I immediately set my odometer at zero. And I did not use any new-fangled driving tricks. I used the same old tricks I have used for years. Some are known to many savvy drivers. You probably use some. But I think a couple are my own—things I’ve picked up by myself on the road. Some are more effective than others, of course. But they all wring out more miles per tankful. I believe this although my close friend Woody strongly disagrees. I’ll tell you about him in a minute. Interested in how I did it? Well, see how my tricks check out against yours. First, I must tell you about an exciting experience eight years ago. My Uncle Jack—91 at the time—was a patient at the Rhode Island Veterans Home in Bristol, R.I. I visited him once a month. It was108 miles to Bristol, with two stops on the way. One in Westerly for a quick walk around beautiful Wilcox Park downtown—it’s also a superb arboretum. And a stop for coffee half an hour later down the road. Oh, I am a shun-piker. Important for you to know this. I drive on our Interstates as little as possible. So to visit my uncle, I traveled on I-95 only to Rte. 234 beyond Mystic. I rode 234 into Westerly. Then Rte. 1 into Rhode Island, turning east on Rte. 138. Then down the long hill to gorgeous Narragansett Bay and over the two great bridges across it to the eastern shore —the Jamestown Bridge to Conanicut Island, and then the massive Senator Pell Bridge. Then dense stop and go traffic on 138 for about 15 miles to the old and narrow but graceful Mount Hope Bridge across scenic Mount Hope Bay. Then five miles or so of slow driving to my uncle’s. So, quite a variety of roads. It was exciting because I was trying a new game I made up. I got myself two rolls of pennies—100 in all. I wasn’t sure how many I’d need. And I put an empty tin can on the floor to my right. The idea was this: I would drop a penny into the can every time my foot touched the brake pedal. My goal was to get to the hospital with as few pennies in the can as possible. A wonderful game. A game of skill and anticipation and fun. Yes, fun! My Rule Number One was: no risky chance taking! Do nothing to impede other drivers! Safety first! Rule Number Two—obey the law. Drive within the posted speed limits—well, reasonably so (who ever respects every limit?) Do not run a red light. Stop at every stop sign. Do not cross a solid white line. My score that first time for that 108 miles was 38 pennies. And I was vigilant. It turned out to be so much fun and so instructive that I wrote a column about it. Later several readers told me they tried it. Very gratifying. I played that game every time I headed to Bristol. My best score was 19. But there was a bigger pay-off. That game sharpened my driving skills. Anticipate and react. Again and again. That was the essence of the game. What’s about to happen and what should I do about it? I now anticipate at the wheel as a regular thing. It’s a wonderful habit. Here’s an example. I’m coming around a curve and I see a green light a quarter mile ahead. Now, a quick decision! Should I speed up to make sure I’ll cruise through before it turns red? Or should I slow down (naturally, without braking!) to glide to a halt in front of the light if it does turn red? Other cars going my way complicate the game. Of course, luck is a factor, as it is in so many aspects of life. That 108 miles to Bristol presented many variations of this challenge. One helpful trick I learned the hard way many years ago. One evening, backing up in the dark, I hit a lamp post. Just a gash on the pole, but a $500 accident to my car. Lesson learned! Backing up is a dangerous maneuver even in broad daylight. We all have three rear-view mirrors but it’s impossible to view all three all the time. And the view is limited. Think of the many times you’ve read about a car backing up and hitting a child, for instance. Besides, backing up is a total waste of energy…gas. I plan my driving for as few back-ups as possible. As we know, nearly every parking spot at every supermarket and shopping plaza in the country makes it necessary for us to pull into it and park. Then back out. I search for a spot to park where I won’t have to do that. Easy. Every such parking lot is designed in double rows with cars parking nose to nose. If possible, I choose a row where two nose-to-nose spots are empty. I drive through the first spot and into the second one and park there. Later, in leaving, I drive out forward. Couldn’t be easier. It’s essential always to drive with a light foot—light on the gas pedal and light on the brake. Besides, my kind of driving is much kinder to the brakes. Nice and steady; no wild spurts up and no frantic braking. Another trick is to limit my speed to 60 mph on Interstates. These days only a terrible slowpoke does that. Like me. Very difficult to stick to 60—80 is usual now. Well, I’ll accelerate to 65 if a heavy-footed demon is tailing me. These roads are designed for faster travel, which means higher speeds. But it’s surprising how fuel efficiency fades at higher speeds. It’s the old law of diminishing returns that comes into play. Driving at 60 is more economical. And safer for sure. Another is to make as few trips as possible. This means consolidating errands. Another is to not run the engine a minute longer than usual. If I’m on my Rte. 154 in Centerbrook and I see our Scenic Steam Train approaching and tooting and the highway gates about to come down, I stop and turn off the ignition. I re-start only once the gates are back up. 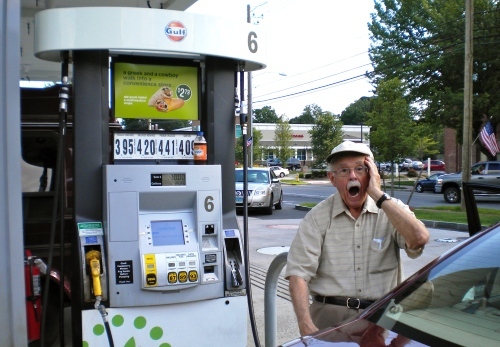 Another is to tank up on gas every time and re-fill only when the gauge is approaching Empty. Stops for four or eight gallons at a time are wasteful in time and money. When possible, tank up in cooler temperatures, usually evening—you get more gas for your money. So I’ve read. Never make a special trip just to buy gas. I practiced all these religiously during my test. As I said, knowing Hyundai’s boast of 35 mpg on the highway for my car, I expected an even better result. I told you I’m a shunpiker. I like to enjoy the ride. Like to look around. See everything. Shunpiking is a natural instinct for me. Some 10 years I drove solo to California in my Dodge Ram camping van. But not shunpiking. I used Interstates nearly all the way. So many boring miles! Getting ready to return home, solo again, I got the idea of making the drive back with as few Interstate Highway miles as possible. I studied the map and plotted a route. Getting out of Los Angeles took me more than three hours! And that’s how difficult much of the trip was. In some stretches, everybody uses the Interstates! There seems no reasonable alternative. But I persisted and found my way. Often I was all alone on narrow old roads for many miles. Through the West and the Midwest and the Great Plains. But I did see some incredible sights. No space here to tell you about all that. Well, I rode all the way across the country into New York State without a single mile on an Interstate! Then, how ironic. Entering my Connecticut, failure! Without warning and without opportunity to turn off, I was led onto I-84. This happened twice! I succeeded for some 3,600 miles, then my accomplishment faded in the final 150 miles. But it was fun trying. I wrote an article about that also. Now, about my friend Woody Boynton in Old Say brook. He’s a retiree like me and a fellow former Peace Corps Volunteer. A smart guy…a fount of info about a wide range of things, including mechanical engineering. He astonishes me every time. I told him about this test of mine. And here is the shocking thing: he told me I was all wet! He pooh-poohed many of my tricks. He said, “You may save a teeny bit. But all those tricks are largely insignificant. They don’t add up to much. What’s important is steady acceleration. And deceleration.” This part I agreed on. But he said it all with such authority that I was crestfallen. Hah! I hate to admit it but he may be right. Maybe that’s why my result of 24.9 was not better. If he is right, there was not much point in my being so diligent and fixated. Maybe I was being dumb in my own way. Please help me. If you are an expert in this big subject of the day, please advise me. Is Woody right? E-mail me at johnguylaplante@yahoo.com. I thank you in advance, and will do so again in a personal reply to you. If I come up with good info from you and others, I’ll share it with our readers. There’s one thing I will not change my opinion about. I love my penny game. It has made me a better driver. Kept me more alert. And given me a lot of fun. Try it once. It doesn’t have to be pennies, of course. Many other things will work. Use silver dollars if you like. Let me know. Talk others into trying it. Maybe together we’ll save a few gallons.